There may be some truth to the saying that some things are best left buried. But that’s a luxury we can't always afford. I was one of a team of archaeologists brought in for a quick study near a big American city, where a major freeway overpass was to be expanded. When the original road was built in the 1930’s, an ancient cemetery had been discovered and partly destroyed. Development rules had changed since then, thank goodness, and this time proper study would be done. Before the project began, we were shown the grainy old photos of construction workers, holding up the skulls they’d found. A seasoned archaeologist can still feel uncomfortable disturbing the dead, even if only to save the remains from destruction. But we had other concerns, as well. Some came from the sky. According to the construction team, some 200,000 cars used the overpass each day, 70 feet above our heads. Several seemed to shed a piece or two as they raced across the skyway. A few times a week, a hubcap would come spinning towards us through the air likely a deadly UFO, shooting up showers of sparks on its impact with the pavement. Bottles and cans were more common, raining down several times a day. There was also danger from below. Between its use as an ancient cemetery and the present day, the land had served dangerous purposes. We were warned to look out for electrical wires as we dug through the greasy black sand--a near impossible task, given the wires’ greasy black color and the speed at which we had to work. Some of these wires were still live, they told us. and if we accidentally severed them their contact with the damp soil could electrocute us all. Worse, the area had once been a major military installation--used as terrain for training exercises, a weapons factory, and a munitions dump. A similar site had been excavated nearby just weeks before, and an unearthed vial of poison gas from the First World War had sent archaeologists to the hospital with burns and blistered lungs. But it was the naval mines we were supposed to be especially cautious of--those cartoonish, spiked, and floating balls designed to blow up ships. They were known to have been produced here in great number, and their many decades underground had likely made their detonating mechanisms weak and unpredictable. One wrong move was all it would take, the foreman warned us. A misplaced poke of a shovel or trowel would blow us up, sky high. When we weren’t dodging and ducking and fearing electrocution with every poke at the sand, we were working hard, illuminating the lives of the people who had laid their loved ones to rest here, five hundred years before. I remember one burial especially well. It was a young woman, whose badly broken leg may well have led to her painful, early death. Her agony was almost palpable still. But the fine necklace around her neck spoke to who she was. It was made of hundreds of tiny panels, a work of precious beauty, and I used tweezers to collect each bead for her reburial by a present day, local tribe. This is the nature of the job. For all the danger and adventure that can accompany archaeology, there’s a great sense of responsibility, as well. We owe a debt to the people who came before us, and to any living people who hold a stake in a specific part of the past. Archaeologists take this dual responsibility very, very seriously, and happily take on the occasional associated risk. 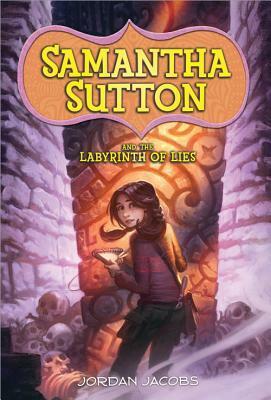 Thanks to Sourcebooks Jabberwocky I have a copy of Samantha Sutton and the Labyrinth of Lies to give away to a lucky reader. This giveaway is for US addresses only. You must be at least 13 years old to enter. Good luck!